Yes, winters at Thunder Butte were a kick. I remember my Dad getting up first to get a fire going in the heating stove, then he would break the ice in the water bucket and in the wash basin, and then he would jump back in bed until the stove got hot. 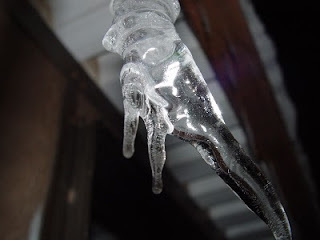 Even with a blazing fire in the wood stove, when it got down around 30 below zero, icicles would form on the window sills and other places from our breath and the coffee pot. It never did get actually warm in the house. There was a lot of standing close to the stove. I’ve stopped at the Ben Ash Monument before without realizing its significance. On July 17th, while on my way to Faith, I took a closer look. About 30 miles west of Faith, South Dakota, on Highway 212, travelers may stumble across the monument at a little cut-out or rest area just off the main road. The monument celebrates the first sighting of the Black Hills by Ben Ash and a small party on December 26, 1875, along what came to be known as the Bismarck Trail. I wrote earlier about the Bismarck Trail here. Of course, this was neither the first sighting of the Black Hills by people, whether Native American, white settlers, fur trappers, or other passersby. Also, the Bismarck Trail did not yet have that appellation, as a survey for the trail wasn’t commissioned by the Dakota Territorial Legislature until 1877. However, Ben Ash and his party were the first to mark the route from Bismarck, and Ben Ash's name was closely linked with the trail for years. The Ben Ash Monument is an interesting marker and does show approximately where the trail cut across the rolling prairie and today’s modern highway. It is often said that you can see remnants of the trail in the patterns of the vegetation as you gaze out across the prairie. On July 17th, as I peered into the distance from the Ben Ash monument, I could see no signs of the trail. Of course, the prairie grass was about three feet tall from an unseasonably wet spring and summer. Later that day, I passed another marker about 35 miles north of Faith on Highway 73 while making my way back from Bison. “At this point the Bismarck – Deadwood Stage Trail passed in a line about 240 miles from northeast to southwest. In 1877, the Dakota Territorial Legislature commissioned the survey of the trail, which transported passengers and freight between Bismarck, the western terminus of the Northern Pacific Railroad, and Deadwood. Rich mineral deposits in the Black Hills had been confirmed by an 1874 expedition led by General George Custer. “The first four-horse Concord stagecoaches, owned by the Northwestern Express, Stage and Transportation Company, started over the trail from Bismarck in April 1877 with daily service in operation by May. A typical run took 36 hours and a one-way ticket cost $23. As many as 26 stagecoaches and more than 200 teams comprised the rolling stock. The company also utilized many mule and oxen wagons to haul freight. Twenty relay stations and two overnight stations serviced the line. The Trail was long out of use by the time my grandfather and his family moved down from Bismarck at the turn of the last century. I’m not clear of the route they took to the environs around Faith, but know that it passed through Fort Yates on the Standing Rock Reservation. Still, I’m sure that in their day they would have seen clear evidence of the old Bismarck Trail in the wagon ruts that crossed the land not far from Thunder Butte, where they lived.